Elle Fanning and a gal pal stop to look at some cats up for adoption on Sunday afternoon (September 4) in Santa Monica, Calif.
After passing the adoption, the 13-year-old actress and her friend headed to the ABS by Allen Schwartz boutique for a little retail therapy. While we wait for more news about Elle’s upcoming movie, Twixt, I can tell you that The Nutcracker: The Untold Story is hitting Blu-ray and DVD shelves on November 1st. In the flick, Elle plays Mary, a little girl whose godfather gives her a special doll one Christmas Eve. Would you girls adopt a lovely little kitten? I just did, and not only one, but two little sweetheards! WOW!!! 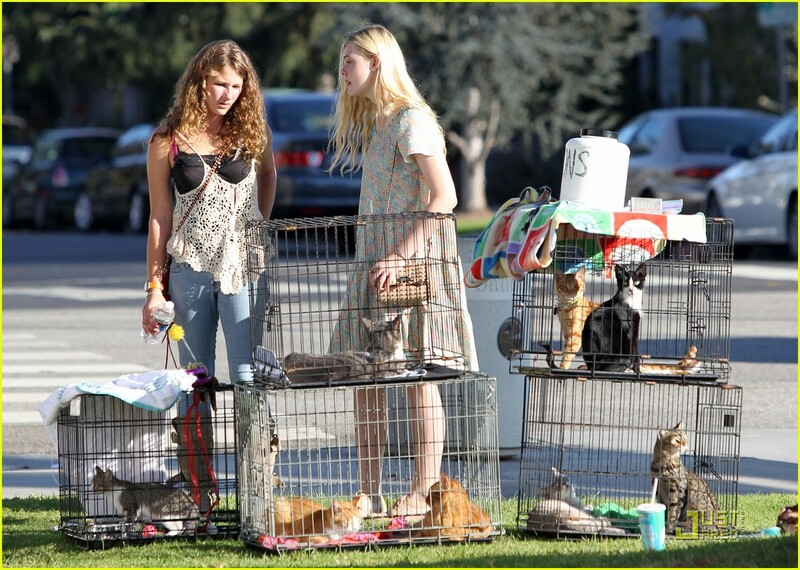 I never thought that Elle Fanning would ever be a cat lady. you know something she looks soooooo gorgeous and the cats look soooooooo cute. I love cats!!!!!!!!! Thanks for sharing. Your post is a useful cooubirttinn.